This report examines the phenomenon of telework in the EU – particularly in the context of the European Framework Agreement on Telework, which was signed by the peak social partners in July 2002. The report first assesses the incidence of telework across the 27 EU Members States and Norway, highlighting the overall increase in telework usage. It goes on to examine the regulatory framework for telework, with a particular focus on the European Framework Agreement’s implementation in the context of national industrial relations systems and given the unique nature of this autonomous agreement. The report also looks at issues concerning the employment and working conditions of teleworkers – such as health and safety, data protection, access to training and the voluntary nature of telework. It concludes with an overview of the social partners’ position on telework. The use and spread of information technology continues to grow in recent times. As a result, more employees have been able to work from remote locations – that is, separate from the premises of their employer – through the use of computer networks and telecommunications devices. Employees who works in this way are referred to as ‘teleworkers’. In the context of the European Employment Strategy, the European Council invited the social partners to negotiate agreements to modernise the organisation of work. The European Commission in its consultation on modernising and improving employment relations invited the European social partners to start negotiations on the issue of telework. As a result of the negotiations at European level, on 16 July 2002 the European Framework Agreement on Telework was concluded and signed by the peak social partners – that is, BusinessEurope (formerly UNICE), the European Association of Craft, Small and Medium-sized Enterprises (UEAPME), the European Centre of Enterprises with Public Participation and of Enterprises of General Economic Interest (CEEP) and the European Trade Union Confederation (ETUC). The framework agreement regulates issues such as employment and working conditions, health and safety, training, and the collective rights of teleworkers. The unique aspect of this agreement was that it should not be implemented through a European directive – as was the case with the three previous intersectoral agreements on parental leave, part-time work and fixed-term work. Instead, it was to be transposed through the autonomous route, in ‘accordance with the procedures and practices specific to management and labour in each Member State’. The social partners agreed to implement measures in each Member State of the European Union by July 2005. In order to review the implementation of the European Framework Agreement on Telework, the signatory parties prepared a joint report, which was agreed upon in June 2006. Furthermore, the European Commission issued its own report in July 2008 on the implementation of the agreement, taking into account findings from an expert report and the EIRO network of correspondents (Visser and Ramos Martin, 2008; European Commission, 2008). present the social partners’ and governments’ views on this form of work organisation. Overall, some 26 EU Member States (no comparative information was available for Cyprus at the time of writing) as well as Norway have contributed national reports to this EIRO study. Furthermore, the report is based on findings of the Fourth European Working Conditions Survey (EWCS), conducted by Eurofound (Parent-Thirion et al, 2007), as well as on recent academic publications. Telework is a form of organising and/or performing work, using information technology, in the context of an employment contract/ relationship, where work, which could also be performed at the employer’s premises, is carried out away from those premises on a regular basis. In nine countries – Belgium, Finland, France, Germany, Greece, Italy, Norway, Spain and the United Kingdom (UK) – the EU-level definition has been used to implement the agreement in the countries’ respective guidelines or national-level collective agreements, while others created a more precise definition of their own. In Poland and Slovenia, the revised labour code provisions resemble the wording used in the European Framework Agreement’s definition. In addition to Poland and Slovenia, a legal definition of telework can be found in the Czech Republic, Hungary, Lithuania and Slovakia. While the latter country addresses telework as work ‘at home or at any other agreed place by using information technologies’, the labour codes in the Czech Republic and Hungary refer to employees who do not work at the employer’s premises, yet without mentioning the use of information technology (IT). In the Lithuanian legislation, telework is considered to be covered by the more general provisions on homeworking. While the definition of telework in the European Framework Agreement is broad in order to cover different forms of telework, it remains open to debate for the industrial relations actors in the Member States which type of teleworker meets these criteria and, in particular, what quantity of time the term ‘regular basis’ refers to. For instance, telework on a ‘regular basis’ could include working away from the employer’s premises five days a week as well as one day a week or less, as long as it is performed on a regular basis. The European Framework Agreement covers employed workers only. While the percentage of people doing telework among those who are self-employed is relatively high in most Member States, this report follows the general, and more limited, definition of the agreement – thus, addressing the issue of employed teleworkers only. This section assesses the extent to which employees are involved in telework in the EU Member States. In addition to a country comparison of the overall proportion of telework, the section will shed light on telework developments in terms of gender, economic sectors and occupation, as well as level of education in Europe. As outlined in the first section, the definition of telework in the European Framework Agreement is kept deliberately broad. While this allows for wider space to agree on definitions in the Member States, the lack of a clear definition presents a problem for measuring and comparing the incidence of telework across countries. As definitions vary throughout Europe, no comparable national statistics on telework are yet available. Since telework is relatively new, the majority of countries have just started gathering statistics on telework; therefore, the national data do not yet have a solid foundation. On the contrary, for example, the Austrian correspondent notes that since telework has become such a natural part of the work routine, research interest in the topic has declined and the national statistic office in Austria subsequently cancelled data collection on these issues in 2003. The figures presented in this report are based on the findings of the 2005 EWCS (Parent-Thirion et al, 2007), a survey of employees and self-employed people, conducted by Eurofound. The EWCS addresses various aspects of work and work organisation, including telework. The added value of this survey is that it is a unified methodological approach, providing comparable and reliable data on working conditions across Europe. The EWCS is based on a multi-stage, stratified random sample, representative of the EU working population aged 15 years and over. Eurofound carried out the survey between 19 September and 30 November 2005. Almost 30,000 European workers were interviewed in 31 countries – that is, in the then 25 EU Member States, along with Bulgaria, Croatia, Norway, Romania, Switzerland and Turkey. The respondents answered more than 100 items on a wide range of issues regarding their employment situation and working conditions. For the cross-country comparison, this report uses the following definition: in order to qualify as a teleworker, the employee must work ‘with a personal computer (PC)’ away from the employer’s premises at least a quarter of the time. This definition fulfils the criteria set out in the European Framework Agreement’s definition, as it includes telework that is done slightly more than one day a week, on average. To complement the overall picture, figures are also given for the incidence of telework that is carried out ‘all or almost all of the time’. A slight deviation from the definition in the agreement appears: the EWCS measures only telework ‘from home’, while the European Framework Agreement covers workplaces away from the employer’s premises other than home as well. However, this deviation can be considered negligible, since evidence from other national or sectoral statistics shows that home is the workplace for the large majority of teleworkers. According to the findings of the EWCS – which covers the 27 EU Member States (EU27) along with Norway – the highest percentage of employees involved in telework was observed in the Czech Republic, where 15.2% of employees were doing telework for a quarter of the time or more (see table below). Bulgaria noted the lowest percentage, with only 1.6% of workers using telework. The figures for teleworking ‘at least a quarter of the time’ vary significantly between the countries. However, the overall trend indicates that employment relationships involving ‘part-time’ telework are on average about four times more common than ‘full-time’ telework. This confirms other findings that telework is used to make employment relationships more flexible, while at the same time avoiding possible difficulties that arise when employees are constantly separated from the working environment at the employer’s premises. above average rates of telework are also found in the Scandinavian countries Finland, Norway and Sweden. Apart from this, the picture regarding telework is quite mixed, with many countries as diverse as Slovakia, Spain and the UK having close to average figures for telework usage. One group of countries made up of eastern and southern Member States – namely, Bulgaria, Hungary, Italy, Portugal and Romania – show very low levels of telework, with a percentage of less than 3%. The use of telework is clearly growing in almost all of the countries surveyed. This form of work is relatively new – concurrent with advances in technology such as the internet, home computing systems and other telecommunication devices. With prices for broadband data transfer and equipment decreasing throughout the EU, telework has also become less expensive to implement. In 2000, the overall average proportion of employees involved in telework was about 5.3% in the ‘older’ 15 EU Member States (EU15) and 4.2% in the then candidate countries. In 2005, the overall proportion had increased to 7% for the entire EU27 (Figure 1). A number of countries have considerably higher rates of increase, as the results in Figure 1 show. Many of the countries with a high incidence of telework also experienced higher growth rates in the five year period 2000 to 2005. Among these countries, the percentage of teleworkers increased almost five-fold in the Czech Republic and more than doubled in Belgium, Denmark and Latvia. Conversely, a decreasing trend in terms of telework usage is evident in five countries – Bulgaria, Cyprus, Luxembourg, Portugal and Romania – while the figure for the UK appears to stagnate at an above average level. These observations are confirmed by other data from the national statistics. For instance, Statistics Netherlands (Centraal Bureau voor de Statistiek, CBS) reported in January 2009 that the proportion of companies employing teleworkers had doubled within four years from 2003 to 2007 (Statistics Netherlands, 2009). Luxembourg is the only EU15 country, in which, according to the EWCS data, telework has decreased over the first five years of this decade. This may be partly explained by the relatively high proportion of cross-border workers in Luxembourg. Cross-border teleworkers may be subject to higher taxes and social security contributions when teleworking, for instance from neighbouring Belgium or France, and this may pose a disincentive to choose this form of work. In terms of different sectors of the economy, a considerably higher use of telework can be found in real estate, financial intermediation and education, where around 15% of the workforce regularly engages in telework at least a quarter of their working time (Figure 2). The figures also show that higher skilled workers are more likely to use telework. Only professional, managerial and technical occupations have more than 10% of employees involved in telework. The trend that employees with higher qualifications are more likely to use telework is confirmed by the EWCS data on educational levels: a quarter of all teleworkers have an upper secondary education, while more than half have a third-level education. Looking at proportions of male and female teleworkers, it emerges that male employees are generally more likely to do telework than female workers: on average, about 8.1% of male employees engage in telework, while 5.8% of female employees use this form of work. Such gender differences can be at least partly explained by the distribution of telework among sectors and occupations. Sectors with a higher incidence of telework – such as real estate and financial intermediation – also tend to have a male-dominated workforce. The same tendency is true for workers in higher skilled occupations as well as technical occupations, where there are less female employees. Gender-segregated labour markets therefore seem to be one of the possible factors explaining the gender differences with regard to telework. Overall results on the distribution of telework for the EU27 are confirmed by the findings of other studies in the Member States. In the case of Belgium, for instance, the majority of teleworkers are men with a high educational qualification, who work in the information and communication technologies (ICT) sector and occupy a management function (Taskin and Vendramin, 2004). In addition, the majority of teleworkers live in urban areas and are not willing to lose time commuting. Women are underrepresented among teleworkers in Belgium, as fewer women work in ICT (ibid). Article 139 of the EC Treaty provides two options for the implementation of agreements concluded by the EU-level social partners. One option is the implementation ‘in accordance with the procedures and practices specific to management and labour and the Member State’. This is referred to as the so-called autonomous route or an autonomous agreement. The second option is to request a Council of Ministers’ decision. The European social partners – more specifically, ETUC on the trade union side and BusinessEurope together with CEEP and UEAPME on the employer side – have concluded three framework agreements. These agreements have been transposed into the directives on parental leave (Council Directive 96/34/EC of 3 June 1996), part-time work (Council Directive 97/81/EC of 15 December 1997) and fixed-term work (Council Directive 1999/70/EC of 28 June 1999), and are now integral part of the acquis communautaire. The European Framework Agreement on Telework has been the first European agreement of the autonomous kind. This results in varied forms of implementation measures, and not one standard path. In the context of Article 139(2) of the EC Treaty, agreements between EU-level social partners are voluntary and autonomous in that they are not foreseen to be implemented by Council decision. On the contrary, these framework agreements ‘shall be implemented in accordance with the practices and procedures specific to management and labour and the Member States’. The social partners, as autonomous actors, may ‘voluntarily’ take up bilateral negotiations on the grounds of Article 139(2) EC. However, the implementation of the agreement by the signatory parties and their affiliated organisations is binding, even if it is not subject to legal enforcement. These agreements had previously been described as ‘voluntary’ agreements. However, with the coming into effect of the new work programme for social dialogue 2006–2008 (EU0605019I), the European social partners changed the terminology for this kind of accord to ‘autonomous’ agreements. Even though the European Framework Agreement on Telework had been concluded in 2002, regulations dealing with telework were already in place in a number of Member States as well as at the European sectoral level (Léonard, 2008; Pochet et al, 2009). In October 1995, Germany secured its first company collective agreement with regard to telework at Deutsche Telekom AG – the agreement was signed by the Postal Workers’ Union (Deutsche Postgewerkschaft, DPG). Since 1999, collective agreements dealing with telework have become commonplace and have existed in companies such as T-Mobile, Allianz, Bosch, Dresdner Bank, Ford, Hypovereinsbank, LVM, Schering, Schott and Siemens. In Austria, a clause was introduced concerning telework in the oil industry in 1997. In doing so, the employers had to bear all expenses associated with a dislocated workplace. In Sweden, the public sector at municipal and regional levels already had a telework agreement in place before the European Framework Agreement was signed. In Norway, the collective agreement in the retail trade sector regulated the issue of telework. At European level, in 2001, the sectoral social dialogue committees for the telecommunications sector and the retail trade sector signed agreements on telework (Pochet et al, 2009). The cross-industry European Framework Agreement on Telework was signed only a year later, while its stipulations were reproduced by the European sectoral social partners in a number of other sectoral agreements at a later stage. Thus, the European Framework Agreement on Telework highlights the emerging interaction and synergies between the European cross-industry and sectoral social dialogue. One important differentiation with regard to the implementation of the European Framework Agreement on Telework is whether it creates ‘hard’ or ‘soft’ law in the respective Member States. ‘Soft law’ is the term applied to EU measures such as guidelines, declarations and opinions. In contrast to ‘hard law’ instruments such as regulations, directives and decisions, soft law measures are not binding on those to whom they are addressed. However, soft law can produce some legal effects and is sometimes presented as a more flexible instrument in achieving policy objectives. In the typology of Marginson and Sisson (2006), hard law involves standard rights and obligations, while regulating core issues – such as pay and working time. It relies on sanctions, is complete and compulsory. Soft law, on the other hand, involves minimum provisions only, regulates ‘soft issues’ such as stress and telework, is incomplete, open-ended and permissive. As the ‘autonomous route’ of implementation gives actors in the Member States the choice of how to transpose the European Framework Agreement, a variety of instruments have been used. The 21 countries that reported some form of implementation of the agreement can be grouped into three main clusters (see Annex for an overview of the different implementation measures in the Member States that had implemented the European Framework Agreement as at May 2009). The most widespread way of implementing the European Framework Agreement has been through collective agreements (Figure 3). Nine countries used collective agreements and these had been concluded mainly at national or intersectoral level. In a second cluster of six Member States, implementation was achieved through various forms of ‘voluntary’ measures – such as joint guidelines, codes and recommendations on telework which are based on the proposals and policies set forth in the agreement. In a last group of six other Member States, national legislation has been enacted in order to implement the European Framework Agreement. Six Member States have noted that, as at May 2009, there has been no implementation of the European Framework Agreement on Telework – the six countries are Bulgaria, Cyprus, Estonia, Lithuania, Malta and Romania. This categorisation may overlap for some countries, as on different levels of the industrial relations system, different but complementary instruments have been used to help regulate telework. While the present categorisation is based on the most important implementation measure found in each country, secondary and supplementary channels of implementation will also be highlighted in the following sections. A group of six Member States – the Czech Republic, Hungary, Poland, Portugal, Slovakia and Slovenia – chose to implement the European Framework Agreement through legislation. Hence, these countries guarantee full coverage and a legally binding force for telework regulations. With the exception of Portugal, all of these countries are new Member States. Given the lack of a strong tradition of collective bargaining in many of the new Member States – particularly at sectoral level – and the rather low density rate of social partner organisations, it appears that governments and social partners preferred to implement the European Framework Agreement through legislation; bipartite agreements would not have ensured a sufficient coverage and comparable binding force. This has led to the somewhat unexpected situation whereby European soft law has been translated into national hard law. This form of implementation ensures a uniform application of the agreement’s major principles, while it may also provide for a wider use of telework. In Hungary, in particular, legislation has been enacted to encourage the spread of telework. Legislation appeared to be the right instrument in this country given the low trade union density, weak social dialogue structures and meagre resources of both sides of industry (Larsen and Andersen, 2007). In addition, legal reform in Hungary has been accompanied by a public policy initiative, including subsidies for employers that want to introduce telework. With regard to the role of the social partners in the legislative process, a distinction can be made between the countries in this group in terms of their degree of consultation and involvement. In Poland, the amendment of the labour code was preceded by a collective agreement at national level. As a result of the compromise – and after consultations in the framework of the Tripartite Commission for Socioeconomic Issues – the government transposed the provisions of the bipartite agreement on telework into a new chapter of the labour code. The social partners in the Czech Republic, Hungary and Slovakia were also consulted by their respective governments during the legislative process. In Hungary, consultations with the social partners were conducted in the tripartite National Interest Reconciliation Council (Országos Érdekegyeztető Tanács, OÉT) before the draft law was presented to the parliament, according to the usual procedure of preparation of employment-related laws. Meanwhile, the Czech social partners discussed the European Framework Agreement and reached consensus on the implementation by means of legislation. In Slovakia, the issue was included on the agenda of the Tripartite Economic and Social Council (Hospodárska a sociálna rada Slovenskej republiky, HSR SR). In contrast, legislative action by the governments in Portugal and Slovenia involved little or no participation by the social partners. In Poland, Portugal and Slovakia, the final legislation comes close to the provisions and major principles agreed on at European level for the framework agreement. However, the recently established legal basis in the Czech Republic, Hungary and Slovenia is less comprehensive. In Hungary, for instance, the principles of reversibility and the voluntary character of telework are not fully addressed. In the Czech Republic and Slovenia, even though equal treatment is guaranteed to all employees working away from employer’s premises, the use of ICT and the related peculiarities as well as possible risks of this kind of work are not sufficiently regulated. The majority of the countries fall into the second group, where the principles of the European Framework Agreement have been implemented through bipartite collective agreements. The nine countries of this predominantly ‘hard law’ cluster – namely, Austria, Belgium, Denmark, Germany, Greece, France, Italy, Luxembourg and Spain – can be differentiated according to the level of scope and binding nature of collective bargaining at national, sectoral or company level. In three of the countries – Belgium, France and Luxembourg – the cross-industry agreements have been extended to everyone through royal, ministerial or Grand Ducal decree respectively, thus allowing for a comprehensive coverage of sectors and companies. As a result, the agreements now cover the entire national workforce. Accordingly, in Figure 3 (see above), these cases have been placed at the upper end of the hard law scale. The remaining six countries of this group – Austria, Denmark, Germany, Greece, Italy and Spain – concluded collective agreements to implement the European Framework Agreement. Due to the limits in their scope of application, these agreements do not cover the entire workforce and are therefore considered a ‘softer’ form of implementation compared with the collective agreements that are extended to all workers. Regarding the level of bargaining – that is, national, sectoral or company level – national and cross-industry level collective agreements seem to dominate in relation to telework regulations. In seven Member States – Belgium, Denmark, France, Greece, Italy, Luxembourg and Spain – collective agreements were concluded at national level. Out of these, Belgium, France and Luxembourg extended the agreements to all employees. In Austria, sectoral-level collective agreements has been the main avenue for regulating telework, although many of these sectoral agreements predate the EU Framework Agreement. Sector-level collective agreements have also been reported for Denmark, Italy and Spain, complementing the regulations of national-level agreements on telework. In Denmark, three collective agreements in manufacturing, retail trade and services and in the public sector have implemented the European Framework Agreement provisions. In Spain, two collective agreements in the chemicals industry and daily press have been reported. A number of sectoral agreements in Italy – such as those covering retail trade, textiles, private medical services and telecommunications – introduce regulations on telework. With regard to the company-level agreements on telework, no comprehensive data are available for all of the countries. Company-level bargaining was of particular importance in Germany, where company-level agreements (Betriebsvereinbarungen) are the typical tool to regulate working conditions for teleworkers. Also, in Spain, a number of company-level agreements on telework have been reported. Although some trade union and employer organisations at confederal and sectoral levels have implemented the telework agreement, a recent study has revealed that most affiliates of the main trade union and employer confederations in Denmark have failed to transpose the telework agreement into collective agreements at sectoral and local levels (Larsen and Andersen, 2007). For example, only one out of 13 affiliates of the Confederation of Danish Employers (Dansk Arbejdsgiverforening, DA) has implemented the telework agreement through collective agreements, while two affiliates have used guidelines for good practice. Similarly, only eight out of 18 affiliates of the Danish Confederation of Trade Unions (Landsorganisationen i Danmark, LO) have transposed the telework agreement into collective agreements. Agreements in the public sector are more likely to take telework regulations into account: some 67 out of the 98 member organisations of the Confederation of Salaried Employees and Civil Servants in Denmark (Funktionærerne og Tjenestemændenes Fællesråd, FTF) have transposed the European Framework Agreement; most of these organisations represent employees in the public sector (ibid). The third group identified comprises six countries – Finland, Ireland, Latvia, the Netherlands, Sweden and the UK. In this particular group, the application of the European Framework Agreement was realised through means such as voluntary agreements, codes of conduct or guidance. The aim of these instruments – which are non-binding and voluntary in character – was to provide information about telework in light of the specific national work regulations in order to facilitate the application of the European Framework Agreement’s stipulations. It should be mentioned that in two of these countries – the Netherlands and Sweden – national-level soft law instruments have been supplemented by binding collective agreements at sectoral level for some branches. However, under the current classification, these cases are still grouped in the ‘soft law’ category, as the voluntary instruments encompass a potentially wider range of employment relationships than the sectoral collective agreements, which are limited in the scope of application to the signatories at sectoral level. Five of these countries – Ireland, Latvia, the Netherlands, Sweden and the UK – have elaborated recommendations, codes of practice or guidance in order to implement the EU-level agreement. In the Netherlands, the bipartite Foundation of Labour (Stichting van de Arbeid) issued a recommendation on the telework agreement, in order to prepare for collective bargaining at sectoral and company level. In Latvia, the principles of the EU agreement have been implemented through a tripartite agreement that provides for non-binding guidelines on the introduction of telework. In Sweden, the social partners agreed on common guidelines for the implementation of the European Framework Agreement. Sectoral-level collective bargaining is then supposed to complement and refine these voluntary agreements. In Ireland and the UK, the social partners and the government have agreed on practical codes and guidance directed at companies. In the UK, for example, the social partner organisations the Confederation of British Industry (CBI), the Trades Union Congress (TUC) and CEEP UK agreed in August 2003 on a guidance on telework, which was then published by the Department of Trade and Industry (now the Department for Business, Innovation and Skills (BIS)). This development is considered by some as a significant step in the evolution of the British industrial relations system. The precise legal status of this document is, however, subject to different interpretations. Whereas both TUC and CEEP UK interpret the telework guidance as an agreement, the CBI director-general describes the text as ‘voluntary, non-binding’. Given the decentralised and limited cover of collective bargaining arrangements in the UK, evidence of organisational responsiveness to and employee take-up of telework arrangements is mixed. In Ireland, the government published a code of practice in 2000 that was updated in light of the European Framework Agreement. A number of Irish trade unions have also issued unilateral guidelines based on the European agreement to be used for negotiating telework arrangements with employers. However, company-level collective agreements incorporating telework issues have not yet been reported. Among the countries that have chosen soft law instruments to implement the European Framework Agreement, Finland has opted for a national-level voluntary agreement on telework. While this national voluntary agreement is non-binding in legal terms, an effective application of the main principles of the agreement can be expected, given the strong structure of industrial relations in Finland. Regarding the differentiation within the soft law cluster on the hard/soft law scale, it can be argued that the national-level voluntary agreement in Finland has a strong ‘moral’ binding force on subsequent collective bargaining processes, since it was signed by the two sides of industry. This is not the case with guidelines, codes and recommendations, which were only jointly issued by the social partners. In Norway, although as a non-EU country not bound by the European Framework Agreement, the national-level social partners developed guidelines for the use of telework against the background of the European Framework Agreement on Telework. Comparable to the developments in Sweden, sectoral collective agreements implement these non-binding guidelines on telework of national level. While European autonomous agreements can be classified as ‘soft law’ – that is, without direct, legally binding force – the European telework agreement has been particularly helpful in placing the issue of telework on the agenda of the social partners at lower levels. In many Member States, this has led to ‘hard law’ results in the form of (binding) collective agreements or national legislation – the latter being introduced in the majority of new Member States. According to Marginson and Sisson (2006), ‘“soft” regulation can be seen as one of the main manifestations of the “Europeanisation” of industrial relations’. The emergence of the autonomous avenue of the European social dialogue certainly strengthens soft law instruments at EU level. Nevertheless, the analysis of the telework agreement’s implementation at national level demonstrates that European soft law has entailed national hard law in the majority of the cases – either in form of national legislation or collective agreements at intersectoral or sectoral level. Some of these collective agreements were even extended to all workers by the competent national authorities. In summary, a total of 15 Member States have used hard law instruments to implement the European autonomous agreement on telework, whereas only six countries have applied soft law mechanisms. Thus, soft law as enshrined in the European Framework Agreement on Telework may be seen as a manifestation of the ‘Europeanisation’ of industrial relations. Nevertheless, this very process may impact on the national systems of labour relations through hard law instruments, as normally produced by the Community method (applied between the Commission, the Council and the European Parliament on the grounds of Articles 251 and 252 of the EC Treaty). Another analytical framework for assessing the implementation avenues is that comprising the categories of autonomy versus heteronomy (see x-axis in Figure 3). Autonomous implementation processes are self-regulatory practices without the interference of third parties, that is, the state. Heteronomous implementation, on the other hand, relies to a varying degree on the intervention of the state, thus giving scope for external regulation. 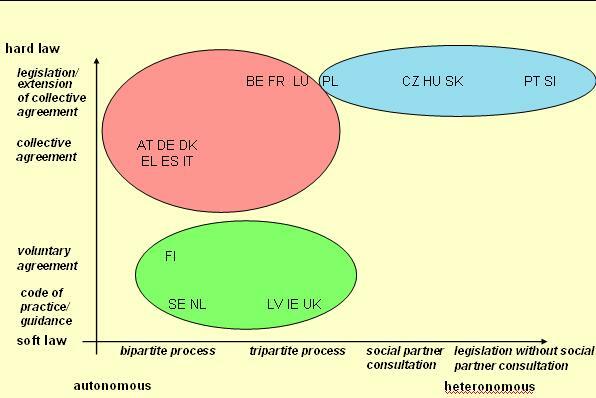 Among the three clusters identified in Figure 3, the legislative implementation variant is the most heteronomous. In this category, the European autonomous agreement has been transposed by external regulation – in other words, through the national legislator. In contrast, the most autonomous variant is the implementation avenue through bipartite collective agreements, whether binding or voluntary. Somewhere in between these two groups are the tripartite processes, which involve the social partners and the state. Moreover, within each hard/soft law cluster, different degrees of autonomy and heteronomy can be identified. Within the legislative cluster, for example, three varying degrees of autonomy versus heteronomy can be identified. The strongest impact of the social partners on the legislative process took place in Poland, where the regulations on telework were introduced to the labour code as a result of a bilateral agreement of the social partners. In a way, this implementation mode emulated at national level the EU-level extension of a social partner agreement by Council decision. In the Czech Republic, Hungary and Slovakia, the national social partners were at least consulted during the legislative implementation. No consultation of management and workers took place in Portugal and Slovenia. In Portugal, the social partners were reportedly not very in favour of the statutory implementation route. Within the collective agreement cluster, different degrees of autonomy or heteronomy can also be observed. At the autonomous end, the binding bipartite collective agreements – evident in Austria, Denmark, Germany, Greece, Italy and Spain – can be found at various levels of the industrial relations structure. At the more heteronomous end are the national collective agreements – seen in Belgium, France and Luxembourg – which are extended by the public authorities to all workers. In the soft law cluster, a bipartite voluntary agreement in Finland, along with bipartite guidelines and recommendations in the Netherlands and Sweden, have been autonomously established by the national social partner organisations – in the case of the Netherlands, this has been established by the bipartite Foundation of Labour. A higher degree of heteronomy can be observed in the second category, where tripartite guidelines (as seen in Latvia) and codes of practice (as observed in Ireland and the UK) have been brokered with some state involvement, which facilitated the conclusion of these documents. In the UK, the telework agreement was only the second act of EU labour policy which entailed national-level negotiation between the BIS (formerly the Department of Trade and Industry), the CBI and the TUC. The BIS did not participate in the negotiations; however, according to some commentators, it facilitated the talks and pressurised the British trade unions in accepting a code of practice as the adequate instrument (Deakin and Koukiadaki, 2007b). As previously analysed, the majority of Member States resorted to hard law instruments – either statutes or collective agreements – in the implementation of the autonomous telework agreement. The rationale behind this approach is clearly evident. In order to make the agreement applicable to the vast majority of workers, the national partners had to recur to a heteronomous actor – that is, the state – to broaden the scope of the agreement either through statutes or extension mechanisms. This approach entails an advantage, but also an inconvenience for the social partners. On the one hand, the social partners are enhancing the effectiveness of the autonomous agreement by increasing the scope of workers to which the provisions will be applied. On the other hand, they are also losing part of their autonomy, especially in the event of the legislative implementation route, since the government may decide to transpose only partially or differently the provisions of the EU-level autonomous agreement. It is not surprising that the heteronomous route has been the main avenue for implementation in those Member States where the actors and processes of social dialogue are still rather weak at national level and, in particular, at sectoral level. In these Member States, the national social partners have relied on the state to ensure the full effectiveness of the European autonomous agreement. Since teleworkers are remote from the daily environment of a centrally located workplace, they often have different working conditions than office employees. For instance, due to the dispersed location of teleworkers, they may be discriminated against with regard to working time, workplace standards or access to training. Other issues, such as the implementation and monitoring of health and safety regulations as well as data protection, may be difficult to apply outside of the employer’s premises. Social isolation and a lack of separation between work and private life can represent further challenges for this type of work organisation. The European Framework Agreement on Telework tries to cope with these problems by protecting the teleworker through a non-discrimination clause and by providing rights relevant for data protection, privacy and access to training, as well as health and safety provisions. In the following sections, the solutions provided by the European Framework Agreement and examples of implementation in the respective countries will be highlighted (see Broughton, 2007 for a comprehensive analysis of working conditions in remote places). The voluntary nature of telework implies that the employees and the employer may introduce telework only by mutual agreement. Accordingly, there is no right as such to telework and there is no obligation to do telework. The European Framework Agreement also ensures that both the employee and the employer may discontinue telework at any time without prejudice to the employment relationship and working conditions. A negotiated agreement between the parties is necessary to arrange issues such as work organisation and the modalities for changing work from the employer’s premises to telework and vice versa. All of the Member States surveyed ensure the voluntary character of telework in one way or another. For example, the national-level agreement in Spain simply reiterates the wording of the European Framework Agreement. More specifically, in France, the national, cross-sector agreement provides that telework must be on a voluntary basis with regard to the employee and the employer, and that if telework was not a condition of recruitment, then it must be dealt with in the employment contract. Moreover, employees who have opted for telework may reverse their decision, while those recruited as teleworkers benefit from an insertion clause. Hence, both categories may rejoin, or join, their employer’s on-site workforce. Elsewhere, in Italy, the collective agreement for the public sector regulates voluntary involvement in telework. While the choice of whether or not to take up telework is left to the employee, priority will be given to workers with disabilities, those who need to be at home to look after family members, and workers who live at a distance from their workplace. In Hungary, the final language of the country’s labour code is rather soft in this respect. Employees can request the change of employment contract only for personal or family reasons, and the employer has to make a decision within 15 days. The European Framework Agreement ensures that teleworkers may enjoy the same collective rights as their colleagues at the employer’s premises. For example, they may participate in or stand for works council elections and have to be considered when calculating thresholds for bodies of collective representation. Among the Member States, a widespread approach was taken to provide teleworkers with the same protection, privileges and obligations as ordinary workers. Most Member States apply the same set of rules to every employee, regardless of whether the work is performed in the company or as telework. The Member States contend that they do not need to go beyond this approach by creating new and specific telework regulations, as applying the same legal framework to all employees creates equality. For example, teleworkers in the Netherlands are protected under a discrimination clause, which is applicable to all workers; nonetheless, they are not protected under a specific discrimination clause due to their classification as a teleworker. However, some countries have opted for the enactment of special clauses for teleworkers in order to ensure that disparities in treatment do not occur. Belgium, a country with a distinctive regulatory framework for teleworkers, provides for a teleworker non-discrimination clause: for instance, it imposes on the employer the obligation to bear the costs associated with telework and equates the working hours of teleworkers with those at the employer’s premises. In the European Framework Agreement, the European social partners agreed to provide teleworkers with the same rights regarding training and career development as other comparable employees. Moreover, the agreement takes account of special training needs for teleworkers in relation to their form of work organisation in a potentially isolated situation. In general, the Member States’ regulations have catered for the same training rights of teleworkers in order to ensure that they are not marginalised in this area. In Italy, for instance, teleworkers are guaranteed the same career development opportunities and are entitled to further specific organisational and technical training. As people who work away from the employer’s premises may suffer from a lack of social contact with their colleagues, some country regulations and collective agreements specifically address these issues. In Portugal, for example, the issue of social isolation for remote workers is dealt with in the labour code, which obliges the employer to promote regular contact between the remote worker and the company and other workers, in order to prevent isolation. In Germany, some works agreements on telework arrange for employees to attend regular meetings at the company premises. In Luxembourg, the national agreement on telework stipulates that employers should ensure that measures are taken to prevent teleworkers from becoming isolated from their office-based colleagues. These initiatives can include providing opportunities for regular meetings and access to company information. In order to remedy this situation, some companies in Spain have brought the training services to the teleworker. For instance, by creating virtual classrooms, companies can provide job training through the universally accessible internet, thus breaking the cumbersome link between location and training. The European Framework Agreement recognises the general applicability of working time regulations to telework, while at the same time stating that ‘the teleworker manages the organisation of his/her working time’. In doing so, the agreement offers more flexibility to teleworkers in the arrangement of their working schedules compared with employees who work at the company premises. The agreement also stipulates that teleworkers’ workload and performance standards are equivalent to those of other employees. The issue of working time has been explicitly dealt with in the vast majority of implementation measures. While most instruments refer to the fact that legislation and collective agreements on maximum working time are applicable to teleworkers, some stipulate specific rules and exemptions regarding certain aspects of working time. For example, under the labour code in the Czech Republic and Slovakia, teleworkers cannot claim bonuses compensating for working overtime, at night, on weekends or on public holidays. In Denmark, the collective agreement for the financial services sector stipulates that teleworkers are not entitled to receive extra supplements if they organise their working hours outside the normal working hours specified in the collective agreement. According to the European Framework Agreement, the employer is responsible for health and safety measures at the teleworker’s workplace. For instance, the employer has to inform the teleworker of risks related to the work. This applies, in particular, to risks related to working with computer equipment. The teleworker is, in turn, responsible for correctly applying these safety policies. With regard to monitoring health and safety, the framework agreement provides that the employer, worker representatives or the relevant authorities have access to the teleworker’s workplace. If the workplace is at home, the consent of the teleworker is required before access can be gained. The principle of equal treatment in terms of health and safety measures for teleworkers and permanent employees is an important dimension of many telework arrangements. The general line is that countries should fully apply health and safety regulations to teleworkers, including those countries where the European Framework Agreement has not yet been formally implemented. In practice, however, it is sometimes problematic for the employer to control and guarantee adequate working conditions, as measures are difficult to implement in workplaces outside of the employer’s premises. In Latvia, although teleworkers are covered by national health and safety legislation, it is reported that compliance is poor in the case of employees working away from the company premises. In Hungary, although employers seem to be reliable in carrying out pre-work employer checks on the working environment and workstation, regular follow-up checks are not as widespread. In Slovenia, the law requires that employers notify the Labour Inspectorate (Inšpektorat Republike Slovenije za delo, IRSD) of any intention to organise working from home. The inspector will then visit the off-site premises and can prohibit homeworking if they believe that it might be dangerous or may damage the health of the worker. In reality, however, although the IRSD reports on work carried out regularly away from employers’ premises, it does not inspect premises used for occasional work in this regard. Individual companies often have their own health and safety procedures for teleworkers. For example, at the oil and petroleum company BP in Portugal, a health and safety inspection is carried out by the company before any telework begins – issues examined include, in particular, space, ergonomics and safety, as well as ensuring compliance with health and safety standards (Broughton, 2007). The privacy of the teleworker is an important issue when the place of work is their home. The European Framework Agreement states that ‘the employer respects the privacy of the teleworker’. If the employer needs to access the workplace, this can only be done after prior notification and with the consent of the employee. Any kind of monitoring system can only be introduced after the worker representatives have been informed and consulted, as required by the Council Directive 90/270 of May 1990 on the minimum safety and health requirements for work with display screen equipment. With regard to data protection, the employer is responsible for taking appropriate measures and informing the teleworker of all relevant legislation as well as in-house policies – for example, in relation to restrictions to use the equipment for private purposes. In Italy, in taking up these stipulations, the national interconfederal agreement declares that privacy is guaranteed and that, if an employer decides to install control devices, they may only be used for the specified purposes. In Denmark, an agreement between the Danish Employers’ Association for the Financial Sector (Finanssektorens Arbejdsgiverforening, FA) and the Financial Services’ Union (Finansforbundet, FF) establishes that access to an employee’s home may only be granted to monitor health and safety regulations, with the permission of the teleworker. Under Poland’s labour code, the employer has the general right to exercise control over telework, while teleworkers retain their right to privacy – as do their families in cases where the teleworker works from home. Checks or repairs of IT equipment are preconditioned on the consent of the worker. This section summarises the views of governments, employers and trade unions regarding the use of telework, while highlighting some national characteristics. The overview is based on the reports of the national EIRO correspondents. Governments in the Member States are generally supportive of the development of telework. As illustrated earlier, some governments chose to enable the development of this form of work organisation by introducing changes to the labour code. Others have opted for more supportive measures – as seen, for example, in the Netherlands – providing for reduced social security contributions for employers using telework. The Dutch government points to the fact that telework may serve as a reintegration tool for marginalised groups of workers as well as for disabled people. In 2006, the Dutch parliament also agreed to waive taxation on employers’ payments for the use of the internet and telephone by employees carrying out telework at home. Telework is seen as a highly attractive option, since it offers certain improvements in the employee’s work-life balance and personal development. A major benefit of telework can be its flexibility with regard to combining working life and childcare. While many correspondents mention that telework is seen as a way of enabling parents to take better care of their children, they also warn that telework should not be a substitute for permanent childcare arrangements. Some governments also view telework as one option for limiting commuter traffic. With less employees travelling to the office premises, rush hour congestion is lowered and fewer carbon dioxide (CO2) emissions occur, therefore contributing to overall environmental and public health goals. In Hungary, in early 2000, government subsidy programmes were launched – albeit with limited success – in order to encourage telework. Such measures were introduced as a means of creating new jobs and to promote the employment of unemployed persons belonging to various disadvantaged groups – such as disabled people, women with small children, ethnic minorities such as the Roma and those living in rural areas. Wage subsidies remain central to current incentive projects offered by the Hungarian government. Employer organisations generally expressed a positive view on telework, as it enables them to take full advantage of flexible work arrangements. One of the main difficulties that employers encounter in the use of telework relates to the costs involved in the initial set-up and management of telework. Nevertheless, in the longer term, according to the respondents, telework is viewed very positively, as it facilitates the flexible use of workers, irrespective of their place of residence. The use of telework is also associated with lower absenteeism. Under tight labour market conditions, involving labour and skill shortages – as seen in Ireland up until the recent recession – telework may help a company to become more attractive to potential recruits, such as employees with childcare responsibilities. This may make it easier for them to recruit people and can open the way to extra recruitment. Employer organisations in the UK are in favour of telework; however, they stress that the government should not view telework as an alternative to investments upgrading public transport infrastructures. In Greece, employer organisations have raised concerns about a potential decrease in productivity. More specifically, they are concerned about the implications that the growth of telework may have in relation to issues such as control over teleworkers, the risk of leaking confidential business data, possible burdens on companies due to the misuse of electronic equipment and problems relating to vocational training opportunities for teleworkers. In 2006, the Industrial Relations Service (IRS) in the UK surveyed 66 employers about their policies on and experience of flexible working and telework. IRS found that home-based teleworking – where employees, who would otherwise be based in an office, use computers and other technology provided by their employer to work from home for a significant part of their working time – was the least common form of telework. Other forms of telework were either regular, nomadic or carried out on an ad hoc basis, with one out of five organisations, corresponding to a total of 14 establishments, employing an average of 10 people in this way. A further six organisations previously employed home-based teleworkers but no longer do so. Just under a quarter of organisations surveyed – a total of 16 establishments – indicated that some jobs were deemed unsuitable for home-based employees. Many employers expected home-based teleworkers to be in the office from time to time, although the practice of this requirement varied widely among the organisations surveyed. With respect to 32 survey responses, 38% of employers felt very positive, 40% positive and 22% neutral about the impact of telework on employee productivity. The trade union view on telework is generally one of cautious support. Trade unions acknowledge the creation of new opportunities for teleworkers in terms of their work–life balance and also see the potential to contribute to equal opportunities for men and women. However, not all of the trade unions’ remarks concerning telework have been totally positive. For instance, trade union representatives expressed concerns over isolation, working hours and schedules. Social isolation not only makes it harder to feel part of a group, but is also associated with creating a career barrier since many teleworkers are ‘out of sight and out of mind’. In addition, teleworkers may experience further stress due to their work schedule. Since many employers do not establish a firm nine-to-five-hour programme, teleworkers have often encountered impossible deadlines and the tendency to become a ‘workaholic’. This underlines the need for clearly defined benchmarks of productivity and desired production per unit of time. Another trade union concern relates to the difficulties involved in organising and representing workers who are scattered over a multitude of different workplaces outside of the company premises. Moreover, in countries with co-determination processes at company level – such as Austria – employee involvement may be harder to achieve if a company employs a number of teleworkers. Finally, many trade unions have expressed concerns over the possibility that the separation of the workplace from the employer’s premises may give rise to a tendency of offering freelance contracts rather than standard employment contracts. Trade unions in Greece, for example, have raised questions over the impact of the telework agreement, since in practice cases have emerged where commercial contracts have replaced traditional employment agreements and where individual employment contracts have replaced the collective regulation of telework. Given the growing importance of telework for a considerable proportion of employees, the European social partners negotiated a European Framework Agreement on the regulation of telework in 2002. In doing so, the signatory parties view telework as a way for employers –both in the private and public sectors – to modernise work organisation, and as a means for employees to improve their work–life balance and achieve greater autonomy at the workplace. The agreement regulates areas such as employment conditions for teleworkers, health and safety, training and collective rights. As telework is a relatively new form of work, reliable national statistics about the use of this form of work organisation are still rare. However, this report was able to draw on the findings of the EWCS carried out by Eurofound that investigates various issues of employment, including the development of telework. Telework is a growing phenomenon throughout the EU Member States. The average proportion of employees involved in telework in the EU27 countries increased from about 5% in 2000 to 7% in 2005. A number of countries show considerably higher rates of increase. The highest proportion of telework is observed in the Czech Republic and Denmark, where about one out of seven employees is regularly involved in telework. Above average rates are also observed in the Benelux countries (Belgium, the Netherlands and Luxembourg), the Nordic states (including Norway) and a number of the new Member States. When comparing different forms of telework, the EWCS shows that telework performed only on a part-time basis is more common than full-time telework. This suggests that, although telework is rarely a substitute for working at the company premises, it is used by a substantial proportion of employees to complement their normal working arrangements at the employer’s premises. Telework is predominantly viewed in positive terms by governments, employers and trade unions. Governments and employer organisations view telework as a means to enhance productivity and employment, while at the same time facilitating overall policy goal in terms of health and the environment. Although trade unions are generally in favour of the use of telework, they also tend to point out the difficulties involved. For example, teleworkers may encounter difficulties regarding their work schedules, training and promotion opportunities, while the representation of teleworkers at distant workplace constitutes a challenge for employee representatives. The autonomous agreement on telework established a general framework at EU level. This was the first time that the European social partners opted for the procedure provided for in Article 139(2) of the EC Treaty – that is, to implement the European Framework Agreement ‘in accordance with the procedures and practices specific to management and labour and the Member States’. As shown in this report, a variety of instruments has been used to apply the principles of the European Framework Agreement in the Member States. The spectrum encompasses legally binding and enforceable legislation (usually in the form of labour code reforms), collective agreements between the social partner organisations (some of which have been extended to all workers through governmental decrees), as well as voluntary measures such as guidelines and codes of practice. The variety of implementation measures and the different coverage rates of the telework regulation – whether through universally applicable legislation, collective bargaining or guidelines – reflect the diversity of industrial relations structures and traditions in the respective Member States. As a result of the diversity of implementation measures, the coverage of the workforce by telework-related regulation seems to vary extensively. In some Member States, coverage of the regulations concerning telework reaches up to 100% of all workplaces due to extension mechanisms or legally binding provisions in the national labour codes. However, in other countries, only a small proportion of employment relationships is covered by the European Framework Agreement on Telework. This is either due to the voluntary nature of the implementing measure chosen, the low representativeness or limited capacity of the social partners, the low coverage rates of collective agreements, or the outcome of a generally limited interest in and awareness of telework itself. The majority of the new Member States in eastern Europe preferred to implement the European Framework Agreement through legislation. However, some basic principles of the agreement – and regulations regarding the use of ICT in particular – have not always been properly transposed into the labour code regulations in the respective countries. From a qualitative point of view, it is again too early to reach a concrete conclusion; nevertheless, initial signs also point in a satisfactory direction. For example, the Deputy General Secretary of ETUC, Helena André, stated in an interview that the first general evaluation of the telework agreement ‘is rather positive’ (ETUC, 2006b). This opinion was also shared by the European employers, which considered the first voluntary agreement a success. The implementation report adopted by the social partners on 28 June 2006 and subsequent updates by the EIRO network also portray a satisfactory picture in this respect. The European Commission conclude in a report that it ‘clearly demonstrates the wealth of social partner initiatives to follow on the EU framework agreement’. Some doubts have, however, been raised by academia with regard to the effectiveness of the voluntary route (Prosser, 2007a). The success of autonomous agreements depends on the capacity of the EU-level social partners to oblige their national affiliates to comply with the agreements’ stipulations and even, if necessary, to impose sanctions on recalcitrant members. Thus, autonomous agreements constitute a considerable challenge for the social partners, as they have to ensure their timely and adequate implementation. Effective implementation of European autonomous agreements is highly dependent on the social partners at national level – more specifically, on their capacity to engage in meaningful social dialogue. Consequently, ‘the ability of the European social partners to control their affiliates is crucial’ for the success of the voluntary route of implementation (Niforou, 2008). Adam, G., European Industrial Relations Observatory (EIRO), ‘Telework in Austria’, Dublin, European Foundation for the Improvement of Living and Working Conditions (Eurofound), 2007. Alsos, K., Nergaard, K. and Lismoen, H., EIRO, ‘Telework in Norway’, Dublin, Eurofound, 2007. Andersson, P., EIRO, ‘Telework in Sweden’, Dublin, Eurofound, 2007. Arasanz Díaz, J., EIRO, ‘Telework in Spain’, Dublin, Eurofound, 2008. Arsov, B., EIRO, ‘Telework in Bulgaria’, Dublin, Eurofound, 2007. Barthélémy, J., ‘Négociation collective au plan européen et intégration des accords dans les droits internes’, Notes Thomas, No. 12, September 2005, pp. 53–57. Blanpain, R., European framework agreements and telework: Law and practice, a European and comparative study, The Hague, Kluwer Law International, 2007. Blažiene, I., EIRO, ‘Telework in Lithuania’, Dublin, Eurofound, 2007. Branch, A., ‘The evolution of the European social dialogue towards greater autonomy: Challenges and potential benefits’, International Journal of Comparative Labour Law and Industrial Relations, Vol. 21, No. 42, 2005, pp. 321–346. Broughton, A., EIRO, ‘Social partners sign teleworking accord’, Dublin, Eurofound, 2002. Broughton, A., European Working Conditions Observatory (EWCO), ‘Place of work and working conditions’, Dublin, Eurofound, 2007. Ciutacu, C., EIRO, ‘Telework in Romania’, Dublin, Eurofound, 2007. Clauwaert, S. and Deinert, O., ‘A new milestone in the EU social dialogue: The Telework Agreement – its interpretation and implementation’, in Gabaglio, E. and Hoffmann, R. (eds. ), European Trade Union Yearbook 2002, Brussels, European Trade Union Institute (ETUI), 2003, pp. 37–63. Clauwaert, S., Düvel, W. and Schömann, I., Report on the implementation of the ETUC/UNICE-UEAPME/CEEP Telework Agreement, Brussels, ETUI, 6 November 2004 (interim version). Coletto, D., EIRO, ‘Telework in Italy’, Dublin, Eurofound, 2007. Czarzasty, J., EIRO, ‘Telework in Poland’, Dublin, Eurofound, 2007. Deakin, S. and Koukiadaki, A., Diffusion of EU-level norms through reflexive governance mechanisms? The implementation of the EU Framework Agreement on Telework in five Member States, Cambridge, Centre for Business Research, University of Cambridge, 2007a. Deakin, S. and Koukiadaki, A., The capability approach and the reception of European social policy in the UK: The case of the Telework Agreement, Cambridge, Centre for Business Research, University of Cambridge, 2007b. ETUC, Voluntary Agreement on Telework, Brussels, ETUC, 2003. ETUC, ‘European social partners present the results of the implementation of the European Telework Agreement’, Press release, Brussels, ETUC, 11 October 2006a. ETUC, Newsletter No. 11, Brussels, ETUC, October 2006b, pp. 10–11. ETUC, UNICE-UEAPME and CEEP, Framework Agreement on Telework, Brussels, 16 July 2002. ETUC, UNICE-UEAPME and CEEP, Implementation of the European Framework Agreement on Telework – Report by the European social partners, Adopted by the Social Dialogue Committee on 28 June 2006, ETUC, September 2006. European Commission, Partnership for change in an enlarged Europe – Enhancing the contribution of European social dialogue, COM(2004) 557 final, Brussels, 2004. European Commission, European Social Dialogue/European Agreement on Telework, CD-ROM, Brussels, 2007. European Commission, Report on the implementation of the social partners’ Framework Agreement on Telework, Commission Staff Working Paper, SEC(2008) 2178, Brussels, 2008. European Economic and Social Committee, Opinion on European governance – a White Paper (COM(2001) 428 final), CES 357/2002 EN/o, Brussels, 20 March 2002. Formosa, M., EIRO, ‘Telework in Malta’, Dublin, Eurofound, 2007. Hála, J., EIRO, ‘Telework in the Czech Republic’, Dublin, Eurofound, 2007. Hárs, A. and Neumann, L., EIRO, ‘Telework in Hungary’, Dublin, Eurofound, 2008. Kaar, R. van het, EIRO, ‘Telework in the Netherlands’, Dublin, Eurofound, 2008. .
Kordošová, M., EIRO, ‘Telework in Slovakia’, Dublin, Eurofound, 2007. Lampousaki, S., EIRO, ‘Telework in Greece’, Dublin, Eurofound, 2008. Larsen, T.P., EIRO, ‘Telework in Denmark’, Dublin, Eurofound, 2008. Larsen, T.P. and Andersen, S.K., ‘A new mode of European regulation? The implementation of the Autonomous Framework Agreement on Telework in five countries’, European Journal of Industrial Relations, Vol. 13, No. 2, 2007, pp. 181–198. Léonard, E., ‘European sectoral social dialogue: An analytical framework, European Journal of Industrial Relations, Vol. 14, No. 4, 2008, pp. 401–419. Lo Faro, A., Regulating social Europe. Reality and myth of collective bargaining in the EC legal order, Oxford, Hart Publishing, 2000. Lužar, B. and Mrčela, A.K., EIRO, ‘Telework in Slovenia’, Dublin, Eurofound, 2008. Marginson, P. and Sisson, K., European integration and industrial relations – Multi-level governance in the making, London, Palgrave Macmillan, 2006. McKay, S., EIRO, ‘Commission reviews social partner agreement on teleworking’, Dublin, Eurofound, 2008. Morin, J., ‘The European social dialogue: A general introduction’, in Blanpain, R., European framework agreements and telework: Law and practice. A European and comparative study, The Hague, Kluwer Law International, 2007, pp. 11–29. Niforou, C., ‘The role of trade unions in the implementation of autonomous framework agreements’, Warwick Papers in Industrial Relations, No. 87, Coventry, University of Warwick, April 2008. Nurmela, K., EIRO, ‘Telework in Estonia’, Dublin, Eurofound, 2007. Parent-Thirion, A., Fernández Macías, E., Hurley, J. and Vermeylen, G., Fourth European Working Conditions Survey, Luxembourg, Office for Official Publications of the European Communities, 2007. Parker, J., EIRO, ‘Telework in the United Kingdom’, Dublin, Eurofound, 2007. Perin, E., EIRO, ‘Telework in Belgium’, Dublin, Eurofound, 2007. Pochet, P., Peeters, A., Léonard, E. and Perin, E., Eurofound, Dynamics of European sectoral social dialogue, Luxembourg, Office for Official Publications of the European Communities, 2009. Prosser, T., Europeanization through procedures and practices?, Copenhagen, Employment Relations Research Centre, University of Copenhagen, 2007a. Prosser, T., ‘Europeanization through procedures and practices? The implementations of the telework and work-related stress agreements in Denmark and the UK’, Paper presented at the 8th European Congress of the International Industrial Relations Association (IIRA), The Dynamics of European Employment Relations, Manchester, 3–6 September 2007b. Statistics Netherlands, ‘Share of companies employing teleworkers has doubled within four years’, Web magazine, 9 January 2009. Taskin, L., ‘Le télétravail en manque de régulations’, Regards Économiques, No. 37, Institut de Recherches Economiques et Sociales de l’Université Catholique de Louvain, February 2006. Taskin, L. and Vendramin, P., Le télétravail, une vague silencieuse, Louvain-la-Neuve, Presses Universitaires de Louvain, 2004. Visser, J. and Ramos Martin, N., Expert report on the implementation of the social partners’ Framework Agreement on Telework, Amsterdam, Institute for Advanced Labour Studies, 2008. Weber, S., ‘Autonome Sozialdialoge auf EU-Ebene. Zur Problematik der Implementation von “Texten der neuen Generation”’, Industrielle Beziehungen, Vol. 15, No. 1, 2008, pp. 53–75. Wlodarski, O., EIRO, ‘Telework in Luxembourg’, Dublin, Eurofound, 2007. The 2002 European Framework Agreement on Telework has been implemented through sectoral and industry-level collective agreements. As a result, 80% of private sector employees are covered by collectively agreed provisions on telework. In the public sector, amendments to the Act on Service Regulations stipulate that public servants may – under certain circumstances – perform (part of) their work as teleworkers. Peak-level talks between the social partners concerning the full implementation of the European Framework Agreement through amendment of the Labour Constitution Act failed in 2005. The main employer organisations presented implementation guidelines to help companies not covered by a collective agreement to implement the Framework Agreement on Telework. The collective agreement of 9 November 2005 – signed according to national practice in the framework of the National Labour Council (Conseil National du Travail/Nationale Arbeidsraad, CNT/NAR) – establishes a framework for telework, which implements the EU-level agreement. The national agreement became compulsory through a Royal Decree of 13 June 2006. In November 2006, these regulations were extended to civil servants. No specific rules on telework have been enacted. Teleworkers are protected to the same level as other employees. No differential treatment is given to full-time employees. There has been no implementation of the European Framework Agreement on Telework. The revised labour code (Act No. 262/2006 Coll., paragraph 317, points a–c) widened the definition of the employment relationship, to also include employees who perform work away from their employer’s premises. However, the labour code does not mention the use of IT. No differential treatment applies to teleworkers’ rights and protection, with the exception of limitations on overtime pay and wage compensation for public holidays, or interruptions caused by adverse weather conditions and personal obstacles. Telework is usually regulated through company agreements, with the first agreement at Telekom dating back to 1995. The role of the national social partner organisations is limited in terms of labour regulation and, therefore, they have only been involved in the provision of information. At sectoral level, social partners in the chemical industry provided recommendations for the implementation of telework at company level. The EU Framework Agreement has been implemented through collective agreements at sectoral as well as intersectoral level. However, affiliates of the social partner organisations at branch and local level did not always succeed in transposing the provisions of the higher-level agreements on telework. The implementation process has been most comprehensive in the public sector. Telework is neither regulated by collective agreements nor by law. Teleworkers are subject to the same provisions as workers at the employer’s premises. The provisions of the European Framework Agreement have been included in the National General Collective Labour Agreement (EGSSE) for 2006–2007 and are therefore binding for all employers and employees. It remains unclear, however, to which extent the EGSSE provisions address the particularities of telework in each branch of the economy. Supplementary regulation by collective or individual agreements may be required. Telework is regulated at national, sectoral and company level. Since 2003, the Intersectoral Agreement on Collective Bargaining has included the provisions of the European Framework Agreement. At sectoral level, two national agreements for the chemical industry and the daily press take account of telework provisions. Further to a regional agreement in Catalonia (2002), company agreements at Siemens Nixdorf Spain (1997), BP Oil Spain (2002), DHL International (2003) and Telefónica (2005) stand out. In the public sector, a Royal Decree caters for the wide usage of telework in state administration. The EU provisions on telework have been implemented through a voluntary agreement at national level. On 23 May 2005, all national trade union confederations and employer organisations signed a voluntary agreement that acknowledged the principles of the 2002 EU agreement. The 2005 national cross-sectoral agreement incorporates the provisions of the European Framework Agreement. The agreement, which was signed by the main employer organisations and trade unions, was extended to all employers and employees in line with the usual extension procedure by 30 May 2006. In 2004, national legislation implemented the 2002 European Framework Agreement into the labour code. While the legislative procedure was inspired by the EU-level agreement, the principles of the reversibility of telework and its voluntary character have not been fully transposed into Hungarian law. No legislation or collective agreements dealing with the 2002 European Framework Agreement exist to date. However, under Ireland’s Sustaining Progress national social partnership agreement (2003–2005), signed by the government and the social partners, there is a commitment to implement the European Framework Agreement on Telework. In 2004, a former code of practice from 2000 was revised by the social partners, namely the Irish Congress of Trade Unions (ICTU) and the Irish Business and Employers’ Confederation (IBEC). This new code of practice takes account of the EU agreement. A number of trade unions – including the Communication Workers’ Union (CWU) and the Manufacturing, Science, Finance Union (MSF) – also provide a set of guidelines for dealing with the issue of telework at company level. In the private sector, the National Interconfederal Agreement, signed in 2004 by 21 employer organisations and three main trade union confederations, sets minimum standards for further bargaining on the telework issue at lower levels. A number of industry-level agreements regulate the transposition of the EU agreement on telework. In the public sector, telework was initially introduced by the public administration Law 191 of 1998. A collective agreement in 1999 laid down the basic principles for the introduction of telework in public administration. A 2007 agreement between the main trade unions and the government provides for several measures to modernise the public sector – this includes measures to increase the number of teleworkers in Italy. There has been no implementation of the European Framework Agreement. Decree No. 1043 and the revised labour code that came into effect on 1 January 2003 provide for regulations on homeworking, which may also apply to teleworkers and therefore ensure equal treatment (Labour Code Articles 108 and 115). However, a number of provisions of the EU-level agreement are not addressed in the legislation, including the use of ICT in particular. The principles of the European Framework Agreement have been transposed through collective agreement. On 21 February 2006, the social partners signed a collective agreement regulating telework that was extended to all employees by the Grand-Ducal Decree of 13 October 2006. The European Framework Agreement was implemented through a tripartite agreement on 12 April 2006. The document comprises non-binding guidelines and information on the introduction of telework. There has been no implementation of the European Framework Agreement provisions. In 2003, the bipartite Foundation of Labour drafted a recommendation on telework, incorporating the 2002 European Framework Agreement. The recommendation explains the principles of the EU agreement and thereby prepares for decentralised bargaining at sectoral and workplace level. Several sectoral-level agreements take account of telework regulations, including the agreements for insurance, youth healthcare, childcare and welfare. To implement the 2002 European Framework Agreement, a collective agreement on telework was concluded by the representative social partners in June 2005, within the Social Dialogue Roundtable for European Integration. This national agreement laid the foundations for the inclusion of a new chapter in the Polish labour code on ‘Employment in the form of telework’. The legal stipulations of this are in line with the EU-level agreement. The implementation of the European Framework Agreement took place through an amendment of the labour code. The new legislation, which came into force in December 2003, addresses the main principles of the EU agreement. There has been no implementation of the agreement so far. The general equal treatment clause applies to all employees. In 2003, the social partners signed the agreement on common guidelines on the national implementation of the European Framework Agreement on Telework. It is up to the social partners at sectoral level to implement the guidelines into collective agreements. This has occurred, to a certain extent, in the public sector and in some branches of the private sector. With the amendment of the labour code in 2007, the government considers the telework agreement to be implemented. The changes to Articles 67–71 of the labour code define telework as a subcategory of homeworking and provide for equal treatment of teleworkers regarding their rights and protection. Since September 2007, telework has been regulated through the country’s amended labour code. The legislation generally provides the same rights for teleworkers as for other employees, as set out in the EU-level agreement. In August 2003, the social partners and the Department of Industry and Trade (now the BIS) published a joint telework guidance, which follows the structure of the European Framework Agreement. The publication of the guidance, which is targeted at the implementation of telework at workplace level, has been accompanied by information campaigns by both the trade unions and employer organisations.